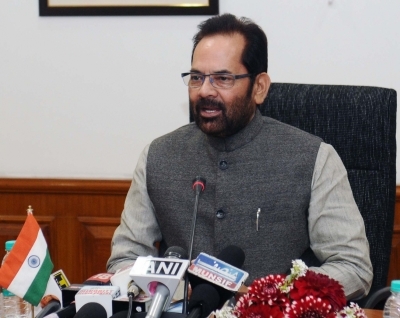 New Delhi, July 19 (IANS) Asking the Congress not to give a communal twist to crimes by cow vigilantes, Union Minister Mukhtar Abbas Naqvi on Wednesday said these incidents did not involve any party or the government but individuals. He also called for a united fight to isolate and tackle those behind such crimes. “These are purely incidents of crime and one should not turn them into communal ones. If you give a communal colour to such heinous crimes, it will only serve the purpose of criminals who want these incidents to be associated with religion,” the Minister of State for Parliamentary Affairs said in the Rajya Sabha. Naqvi’s remarks came after Leader of the Opposition Ghulam Nabi Azad blamed the Centre for the growing number of communal lynching in the past three years. The Minister said the opposition had been raising the issue as part of a conspiracy since they could not find any corruption in the Modi government. “So they are using this issue to defame the government,” he said. He said Azad’s claim of inaction against perpetrators of lynching was untrue as cases were immediately registered and suspects arrested in Rajasthan, Haryana, Jharkhand and Maharashtra. “Even during the all-party meeting (July 16) where Azadji was present, the Prime Minister said some anti-social elements had turned the issue of ‘gau raksha’ (cow protection) into a tool for spreading anarchy,” he said. Modi had made it clear that such incidents were negatively impacting the nation’s image and had asked state governments to take strict action against anarchist and anti-social elements, he added. He pointed out that such incidents occurred even during the earlier United Progressive Alliance government.